From Lodi (see map) California, comes “Petite-Petit” red wine; a blend of 85% Petite Sirah (not to be confused with Syrah/Shiraz) and 15% Petite Verdot. 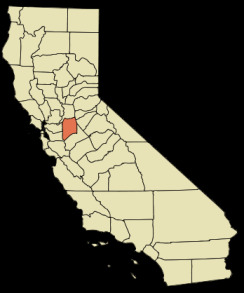 Lodi is an AVA (American Viticultural Area) akin to the Italian DOG/DOGC or French AOC, and is located within the larger Central Valley region. Although Lodi is about seventy miles east of the coast (San Francisco Bay), its rivers provide it with a more Mediterranean climate than might be expected. Petite Sirah (aka Durif) is a black skinned grape and this comes through in the glass by the wine showing as dark purple. 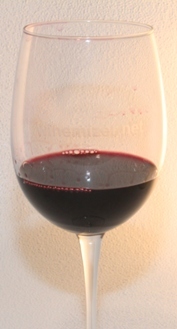 Petite Verdot is often used in blending the magnificent wines of Bordeaux, though in a smaller percentage. It is unfruity, offers earthy tastes and is also dark in color. Each of these varietals is available as a stand-alone and are (for me) excellent “winter wines” offering a chewy full bodyness that goes well with the heavier dishes of cold weather. Looking at Petite Petit in the glass, one anticipates a bold, teeth staining dry wine. But the nose instead reminded me of chocolate covered blueberries, with emphasis on the blueberry. The taste is fruit-rich with jammy plum and blueberry, a hint of sweetness from the fruit. I would prefer more acidity for a crisp finish, but know that many people will enjoy the fruit and softness of the wine, particularly newer wine drinkers. Aerate the wine in your mouth while making a sucking sound (OK, do this alone) and the blueberry pops. Michael David winery ages the wine for 16 months in French Oak which smoothes the edges of Sirah and you should expect to taste some vanilla because of this, though I didn’t find it out of balance. 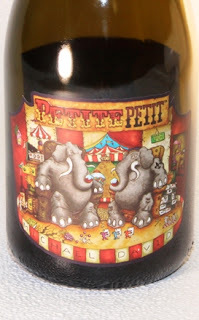 “Petite Petit” (for me) had a short finish that fell off quickly with a slight taste of black pepper spice; a contribution I suspect from the Petite Verdot, and a very slight hint of earth. This is not a complex wine that has layers of flavor, or has tastes that develop and progress and change significantly in the mouth. But given that it is commonly available and at under $17, is easy drinking and “backyard food friendly,” it offers good value. It’s often described as a wine that goes well with pizza, but I see it as a better accompaniment to baby back ribs thickly sauced.